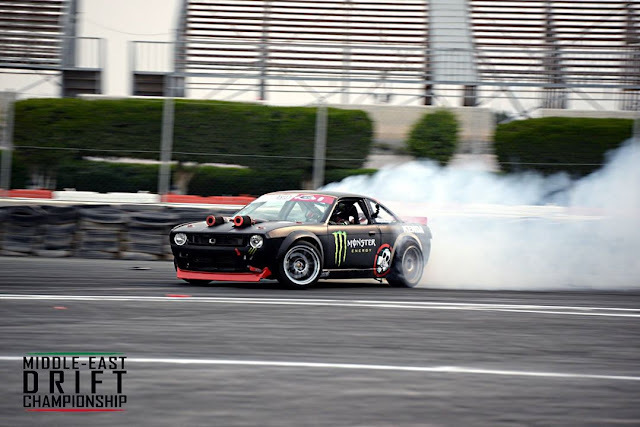 For the first time the 2017 Middle East Drift Championship round 1 kicked off at the Qatar racing Club, in Doha, Qatar. An all new custom layout was designed in collaboration with the host club the QRC to test the very best drivers from across the region. MEDC brought together the best drivers from across the region to create a fresh line up of events with an an unpredictable night of driving and skill keeping the crowds cheering all the way to the end of the event. The top 16 best drivers came from all over the region and guest stars from Europe included Eastern European Champion Dmitriy Illyuk and Latvian Champion Kristaps Bluss. Qualification was full of dramatic surprises with many mechanical and driver error’s being eliminated from the Top 16. Falah Al Jarba was the first victim with his FJR Racing Chevrolet Camaro colliding with the wall and rolling with a heavy impact, luckily due to the new safety rules he was perfectly fine. Formula D star Kristaps Bluss would have trouble setting up his MK Racing BMW E46 and in both run’s spin out. 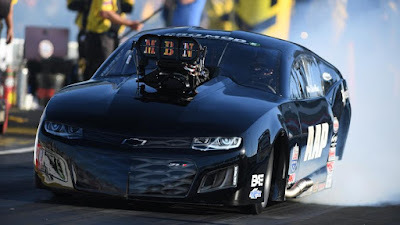 There was a big tension felt by drivers in the air as they all drove on the line with more speed and aggression to match the International judges criteria required in qualifying. The best run of the day was clinched by Mohammad AlKhaiat in his MK Racing BMW 2 series from Qatar in his crazy 800hp BMW who took P1 showing great speed and pin point precision driving getting all the clipping points. The only driver to do so in all of qualifying. Putting down the power and right lines was Abu Dhabi driver Khalifa bin Sultan Al Nayhan took P2 in his Lunatics by Nature X Monster Energy Nissan S14 V8 again showing great control. Seasoned veteran Ahmad Daham with his Red Bull Nissan S15 was keen to make a point but struggle with his line to come in at P3. He was closely followed by the Monster Energy Army of Dany Neville from Lebanon in 4th and Ukrainian Monster Dmitriy Illyuk driver in 5th. 2016 Qatar Drift Champion Ali Makhseed would lose to rising star Mohamad Alkhaiat , with the MK racing driver showing great speed and consistency. Monster Energy team mates Dany Neville and Dmitriy Illyuk would duke it out but Dmitriy would make a huge mistake colliding with his team mate and ending his day. Khalifa bin Sultan Al Nayhan was showing great form with good speed and consistent lines and would send local driver Jaseem Al Suwaidhi packing in the great 8 with two very strong lead and chase runs. The final 4 was set with some titanic battles between with Kuwait, Lebanon, Qatar and UAE all being represented in a true Middle East Battle. First up was Lunatics by Nature x Monster Energy Khalifa bin Sultan Al Nayhan against Kuwait Driver Mesyar Abushaibah. Mesyar showed great speed and actually caught Khalifa off guard gaining a slight advantage. After a great lead run by Al Nayhan it was too much of an advantage to over turn sending Mesyar into the finals. In the other semi final on Form Mohamad Alkhaiat was having the drive of his life. He would show huge speed and commitment and with a mistake from Dany was enough to send him into the final. 3rd place battle between Lunatics by Natures team mates would be very close again but Al Nayhan would take the win gifting him his very first podium of his rookie year a great debut for the young Abu Dhabi driver with a huge future. The Final was set , Kuwait Drift Champion Mesyar Abushaibah Vs Rising Qatari driver Mohamad Alkhaiat . With both vehicles between 800-1000 hp it truly show how these purpose built Drift Machines(Most Powerful saloon cars) have shown how far Professional drifting has come in the region. Alkhaiat would lay down a great lead run but Mesyar would follow him with great proximity. On the return leg Mesyar would put down a great run but a big straighten from Alkhaiat would be enough to give Mesyar the win. Mesyar Abudhaibah –Added later on the podium. ‘I would to thank Driftline Team and Sideways Shop for building me a fantastic car that could compete against the best car builders in Europe and Asia. The win in the biggest drifting competition in the Middle East boosted our confidence even more! We were confident on what the car can do and can assure you there's more to come from the S14 and our team. Even more thanks goes to the best drift organizers I've witnessed being the Drift All-star team. We wouldn't have this car, met these people, won these events without them. They truly have introduced drifting not as a hobby, but as a professional motor sport to the Middle East. To combine with a great opening event to the season the Live coverage of both Qualifying and the elimination battles where broadcasted live across Arab GT (Biggest Automotive publisher in the region) Top 10 news publisher. Viewership reached 2.2 Million fans across the region with 400,000 viewers tuning into the Live broadcast. Engagement was huge with over 43,000 fans liking sharing posting and commenting on the event online. A great demograph of 18-30 followed the event showing this is the millennial motorsport in the Middle East.